He officially opened his first school – The Kiai Karate Club in Arnos Vale, St. Vincent, on the January 19, 2004, and not stopping there sought to try and spread karate throughout St. Vincent and the Grenadines. The idea of a karate club in Bequia first began when a parent of one of his students – Tiare Zoffoli asked him to come to Bequia to teach womenâs self defence as well as introduce karate to Bequia. After some consideration, he decided to start his teaching in Bequia, and so the Kiai Club no. 2 was started on November 1, 2006, with about 15 members. In the beginning, practice sessions took place at the then âTimberhouseâ in Port Elizabeth. After the Timberhouse became unavailable, the Rotary Club of Bequia kindly offered one of their buildings at Lower Bay to be used as a dojo. This entailed a tremendous amount of work which was only made possible by the generous and dedicated support of Tiare and Andrea Zoffoli. 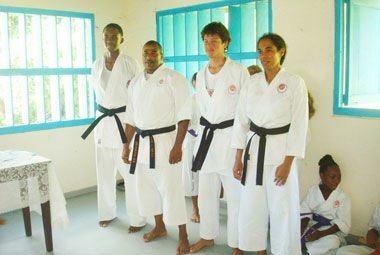 The club is growing from strength to strength in Bequia, with about 30 members, aged 5 to 50 years, and now others are seeking to join, since the club has made history when it raised its first generation of black belts (first female – Pinky Bronisas and 2 teens Zachary Davis and Earl Martindale) at the 2011 examinations held on August 29, at the Kiai club in St. Vincent. The Kiai shotokan karate school is a registered member of the International Shotokan Karate Federation and Sensei Selwyn Gibson keeps himself well upgraded by attending Master Camp in Philadelphia, USA, once a year. At this Master Camp, karate instructors from all over the world come together to upgrade their knowledge and train with the Masters. This knowledge is brought back by Sensei Gibson and transferred to his students at practise sessions, where the true essence of karate is upheld. When karate is practised sincerely, it builds confidence, promotes physical and mental fitness, improves fighting ability in self defence and enhances longevity of life. By its teachings it instils the virtues of honour and consideration – encouraging always a greater awareness of others and a genuine desire to leave only pleasant and fond memories as one journey along âthe wayâ. Karate is more than just an impressive physical system. It is a deep philosophy and a unique expression of the Japanese warrior spirit. The aim is to provide students with the discipline and training to strengthen the body and mind – teaching both adults and children to think for themselves on their feet, particularly at times of crisis or overwhelming stress, and to ultimately develop oneâs character – building a better society for all.